If you recently completed an addiction program and are leading a life free from drugs and alcohol, there is a good chance that you are going to meetings of recovery on a regular basis. While there are several modalities to subscribe to, the 12 Steps is the method that most people accept. Hopefully, you are attending meetings regularly; those who commit themselves to being present at 90 meetings in 90 days (90-in-90) stand a better chance of avoiding relapse. Keep in mind, anytime you're in a group it is an hour-plus of your life that you are not living in your head; when you are in the company of others with similar goals, you are not going to find yourself with a beer in your hand. 12 Step gatherings, or SMART Recovery groups (if that is your technique), are an outlet for people to talk about what is working. Surrounding yourself with people who understand what you are going through is both empowering and is constructive. When you share with your peers, it allows you to get what is holding you back off your chest. In many cases, someone will come up to you and express gratitude for your candor; they may even have some suggestions on how you might rectify a specific struggle. The point is that opening up to the group provides you an opportunity to work through issues, while simultaneously fostering lifelong relationships with your peers. We are always quick to remind people in recovery that you can't manage the momentous task of sobriety on your own; you need help. Addiction may be able to survive on self-will, but recovery cannot! Keeping that in mind, while getting to as many meetings as possible is paramount, it is imperative that you do not head for the hills as soon as the meeting comes to a close. You can gain a whole lot of insight from sticking around after the meeting. Meeting makers make it, as the saying goes; and meeting makers who prioritize spending time with their fellows afterward are, in fact, more likely to make it (achieve long-term recovery). A large number of people new to the program are not all that keen on attending meetings, owing to the uncomfortable nature of early recovery. It can be hard to bare your soul to perfect strangers, even if you know doing so is vital. If you fall into that camp, please know that is entirely normal. Early on in your mission for personal growth, there is still echoes of your past bouncing around inside your head. Despite being in a form of remission, your disease is still a part of you; mental illness is always trying to get back into the spotlight in many ways. The desire to isolate and keep your thoughts to yourself for fear of judgment or ridicule is a vestige of your addictive past that doesn’t fade quickly. You were instructed to go to meetings, so you are; you were told to share, so you raise your hand; but for many people, and maybe for you too, the thought of socializing after the meeting seems like more than they signed up for. When the session concludes, you participate in the closing traditions and respectfully depart. It is strongly encouraged that you resist the temptation to rush away from the meeting house. Firstly, if you find that sharing with strangers makes you uncomfortable, then it stands to reason that taking time to get to know your peers will counter the sensation. Investing energy into befriending individual members of the group will allow for forming bonds that will, in turn, make you feel more relaxed the next time your share. Second, most people don’t have plans for after the meeting; being by yourself (idle time) makes you more vulnerable to cravings. 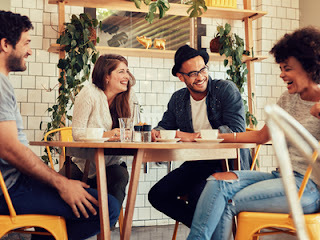 Spending some time with people after the meeting can protect your from “stinking thinking.” And lastly, it can be a lot of fun socializing with people in the program; those with more time than you can help you see that sobriety isn’t just a group of people sitting in circles growing moss. Hope by the Sea can help you or a loved one break the cycle of addiction and provide you with tools for living a life in recovery. Please contact us today to discuss your treatment options.